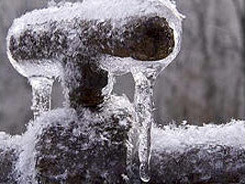 In earlier times when the city had several days of exceptionally cold weather water pipes would freeze. Workmen built a bon fire to thaw the street pavement; then the fire would be extinguished so the pavement blocks could be removed. After the blocks had been lifted the fire was started again to thaw out the ground. When the ground had been thawed as far as possible, the fire was again extinguished and the work of digging with shovel and pick began. When the earth had been removed as far down as the frost permitted, the fire was again started and the thawing process repeated. This continued until the frozen pipes were reached. Hard wood was used as pine did not make a sufficiently hot fire nor did it keep a steady heat. At least a cord of wood was used to thaw a single pipe. If a house was on the opposite side of the street from the water pipe, it was necessary to dig two holes; one next to the water main and one next to the walk adjoining the house. Even then there was a chance the frozen part might be between the two holes. The work continued all night and the fires kept burning if the thawing had not been accomplished during the day. It was a great bother as well as expensive, and the individual had to pay the expenses, not the city.